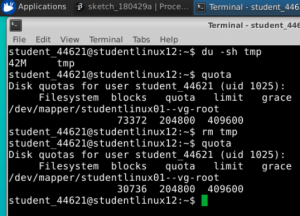 KTBYTE students often use a Linux “Virtual Machine” to attend class and share a screen with instructors. However, students typically have a limited space “quota“. 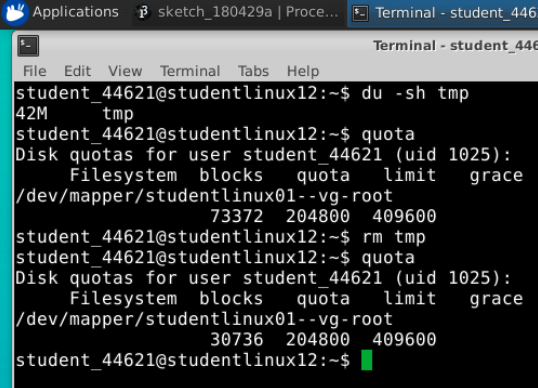 If students go over the quota, the machine may no longer allow them to connect. So, it’s important to check your quota every once in a while (we recommend once every two months, or every time you create many new files, especially images/audio/video). Open the Terminal program by either right clicking on the desktop (“Open Terminal Here”), or click on the applications menu at the top left (“Terminal Emulator”). Type “quota” and press enter. The output may seem intimidating, but don’t panic! Look at the number under ‘blocks’. That is how much space is currently being used! As the ‘blocks’ number approaches the ‘quota’ and ‘limit’ numbers, you have increased risk of running out of space! How do you clear up your disk space?